Having recently signed up to review all of the Pure Steel Records releases, I've spent the last few weeks heartily pouring over all of the bands they have to offer and I can tell you now that my reviewing job just got a whole lot more enjoyable because this is a record label that means business. There is some great talent on board and you are going to be introduced to some wonderful music in the coming months. 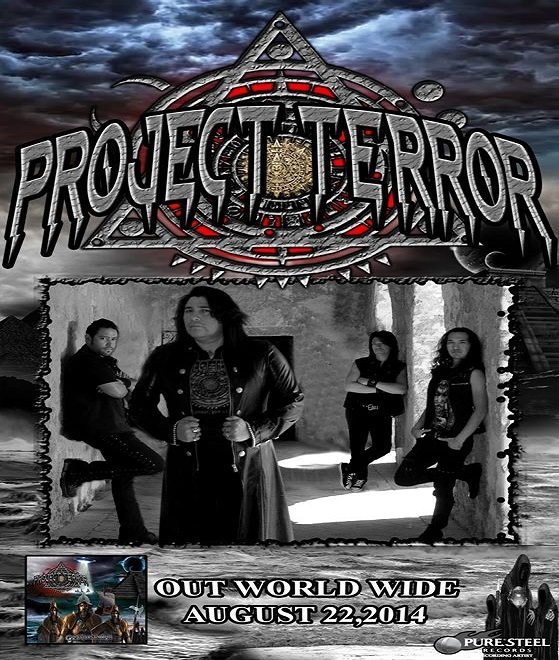 First up is the debut album 'Conquistador' from San Antonio, Texas US Metal band Project Terror. Now you might not have heard the band name before but if you are a fan of Euro/UK Classic Metal, and particularly the Band Vicious Rumors, then you should have heard of vocalist Ronnie Stixx! I, not surprisingly, love Vicious Rumors so when I saw this sitting in the release list then it was a no brainer! Project Terror have been around since 2009 and have opened for Sabaton but have finally found what appears to be the right lineup and have delivered eight tracks of storming Heavy Metal. Apart from VR, if you love Judas Priest, Saxon, Iced Earth, Gamma Ray, Metal Church and Helloween etc then 'Conquistador' will be a welcome addition to your collection. Ronnie has an excellent voice, able to contend with low and high notes pretty effortlessly and he never veers off into annoying and piercing off key squealing which some power metal vocalists do unfortunately. In fact he's very Rob Halford in places! All the correct musical chops are present too. Blistering riffs and guitar solos, thumping double bas drumming and thundering bass lines. Songs are catchy and even though you've probably heard it all a hundred times before, this album never feels stale or boring and the band obviously had great fun recording it! My only issue with it is the production which is fairly hollow and tinny but it's obviously been completed on a small budget and the enthusiasm in the songs more than makes for the lack in oomph. I'd also like to see a little more creativity with the track titles as three of them are names of Priest songs, namely 'Killing Machine', 'Blood Red Skies' and 'United'. That's just a slight niggle though and at least you know exactly what you're going to get. Overall 'Conquistador' is a great album and certainly betters and is much more fun than the latest Iced Earth album song wise! If they can get a decent producer and mix for album number two then Power Metallers the world over will sit up and take notice! Project Terror...a new name to add to the collection!